I’ve started to realize lately that there is a lot of great music out there that for myself and many others was quintessential (and impossible to miss) when we were in our formative years, yet might be completely mysterious and unknown to modern generations. For that reason I’ve started to think that doing a lot of these retro reviews might introduce a lot of younger listeners to these classic discs. They could be drawn in for coverage of some recent release and then dig in and find something they didn’t know about. So, that’s why I’m tackling this, one of the most famous albums of the 1970’s. 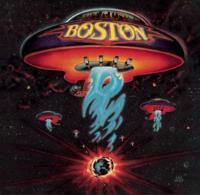 Boston had an incredible sound and this album was a high point in their career which they never matched (commercially or artistically). Virtually everything on this disc was all over the radio when it came out. That’s a well earned distinction as this music just plain works. It’s some of the best songwriting and performance to come out of the 1970’s. It’s catchy and yet still musically interesting. If you’ve never checked this one out, you really need to. It’s one of the greats of the decade known as the 1970’s. One of the band’s biggest hits – OK, pretty much everything here can be reviewed with something that starts off this way – this is a killer piece that still holds up extremely well. The guitar sound is clean and yet crunchy. The chorus is catchy. The song is quintessential 1970’s arena rock – and yet it still feels relevant today. The guitar solo is oh so tasty. This comes in a bit more organic than the opener. Still, it works its way out into another smoking jam that’s every bit as classic 1970’s hard rock. Again this one was all over the radio in the day and still seems fresh somehow. A two piece number, this leads off with a killer instrumental that comes pretty close to progressive rock territory. It is one of the more dominant keyboard showings on the album. A nearly classical crescendo takes it around the two minute mark. Then sedate keyboards serve as the segue into the next part of the track. This rises up into another smoking jam that is just plain essential. It’s perhaps a bit more “rock and roll” than some of the other material here. With autobiographical lyrics and a great guitar sound, this is (appropriately) even more pure rock and roll than the previous track. While this is still a killer piece of music, it’s perhaps one of the least impressive pieces here. As good as this is, that says a lot. Another with a more pure rock and roll sound, this is perhaps the least like the other music here of anything. That said, it still rocks out extremely well. I can hear Aerosmith on this at times, but also White Witch and Argent. The extended instrumental section does have more of those progressive rock leanings and the keyboards really shine here. They start things mellow and balladic. This is a stark contrast to the hard rocking fury of the last track. They build on this theme in a motif that could really best be called “classic 1970’s rock music.” The instrumental break on this one is at times progressive rock like. It’s also quite strong and features both keyboard dominated sections and guitar soloing. The extended outro on this has some of the best guitar work of the whole disc. The opening here with its keyboards and spacey vocals makes one think that they are about to launch into a real progressive rock jam. It turns a quick corner into one of the more straight ahead rockers on the disc. Can you think of a much more 1970’s song title than that? The track really reflects sounds from that era. Perhaps this is the most dated piece here. Still, it holds up pretty well. It has a more balladic approach and is one of the mellower pieces on show. At times I can hear George Harrison or Eric Clapton on this.